Washington is a consummate example of natural beauty; a characteristic that is becoming increasingly rare in contemporary travel. The high mountains of the Cascade Range run north-south, bisecting the state. If you’re planning a trip to find Bigfoot, also called Sasquatch, know that you won’t be able to hunt the elusive creature in some of its alleged natural habitat. Named after the first President of the United States, Washington state lies in the Pacific Northwest and is home to a diverse geography and a rich tradition of agriculture. After years of claim disputes with other nations, such as France and England, the United States admitted Washington into the union as the 42nd state in 1889. Washington, the Evergreen State, hoists the second highest population on America's west coast and houses three national parks. From the industry and business driven city-life of Seattle to the infamous and active Mount St. Helens volcano, and everything in between, an extensive menu of entertainment options ensures a great tourism experience for the whole group in the beautiful state of Washington. When traveling to Washington state, taking in the coastal sea life is an absolute must. San Juan Island, just of Washington's coast, offers unforgettable sea safaris. Sea Safaris are small group wildlife exploration cruises that often introduce its travelers to the amazing Orca whale. The Orca whale, who is actually a member of the dolphin family and often referred to as a killer whale, isn't the only incredible sea life travelers may come across on a sea safari. Bald eagles, seals, sea lions, otters, minke whales, porpoises, and gray & humpback whales also thrive off of the United States' northwestern coast. A run-in with one of these magnificent creatures in their natural habitat is sure to be an irreplaceable experience. Despite all of the natural beauty just off the coast of the state, it is hard to ignore nature's successes within the land locked portion of Washington. With three nationally protected parks and an active volcano, Washington state is one of the purest and cleanest destinations in the United States. Washington state is composed of thick rainforests, mesmerizing mountainous terrain, and a fertile agricultural center to the east. The state's fertile soil and agricultural prowess contribute to Washington’s ranking as the nation's second largest wine producer. Over five hundred wineries are located within state lines and many of them offer educational and entertaining tours of their wine producing facilities. Winery tours are sure to be accompanied by their self-manufactured warming spirits. Seattle is the largest and most densely populated city in Washington state. This vibrant city offers entertainment in many appealing forms. Numerous professional sports franchises call Seattle home and the locals are known for their relentless support. Seattle has a rather impressive musical history. The city served as a home to young up and coming jazz musicians of the early twentieth century and then lead the evolution of the grunge scene with their contribution of the bands Nirvana and Pearl Jam. Seattle's skyline, lead by the famous space needle, is incredibly picturesque. Beneath the lights of the skyline, Seattle offers a wide array of entertainment for citizens and visitors alike. 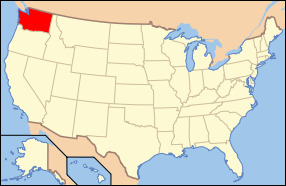 Washington was carved out of the western part of Washington Territory which had been ceded by Britain in 1846 by the Oregon Treaty as settlement of the Oregon Boundary Dispute. Washington state of the Pacific Coast had many established tribes of Native Americans, each with its own unique culture. Today, they are most notable for their totem poles and their ornately carved canoes and masks.